An increase in deportations of Southeast Asian-Americans has been having a devastating impact on our API communities. Many Southeast Asian-Americans immigrated to the U.S. as refugees of wars, bombings, and genocide that occured in Vietnam, Cambodia, and Laos that the U.S. was involved in. Many of the refugees do not even have a memory of their “home countries” and were born in refugee camps, and cannot speak the languages of those countries; they do not feel an emotional connection and it is difficult to adjust to their lives in completely different countries. Southeast Asian-Americans suffer from traumatic experiences, and they had come to the U.S. to escape the violence in their homes to build a better live and seek safety. Cambodia’s repatriation agreement from 2002 and Vietnam’s agreement from 2008(which says people who immigrated after July 12, 1995, may be repatriated) with the U.S. has allowed hundreds of people to be deported from the U.S. Laos does not have a formal agreement, but Laotian-Americans have also been impacted greatly from deportations. However, these deportations have been increasing rapidly with the crackdown on Southeast Asian refugees under the Trump administration, and is just one of many examples that reflect the growing xenophobic sentiment and criminalization of immigration. Other examples include the current government shutdown over funding for the border wall, threats to birthright citizenship, ICE raids, and warnings of pulling federal funds from sanctuary cities, like San Francisco. Recent negotiations with Vietnam1 about their repatriation agreement to allow all refugees to be deported, regardless of their immigration date, and the political maneuverings of the U.S. to pressure an unwilling Cambodia to accept deported refugees2 has threatened the safety of thousands of community members. At least 16,000 community members have received final orders of deportations, more than 13,000 of which are based on old criminal records, more than 200 Vietnamese and Cambodian refugees were deported in 2017, and more than at least 14,000 people living “in limbo”, which means not knowing whether they will be deported or not3. The fear and restrictions imposed on the lives of immigrant communities is making a negative impact; family members are separated, their safety is threatened, their mental healths are compromised, and they are punished unjustly for past crimes, as refugees from wars and violence that the U.S. was involved in. Many of the people under the threat of deportation are guardians and the primary earners of families. My heart goes out to all of the community members who are affected by the recent deportations. Despite the disheartening news, it is important that we stay hopeful and find ways to prevent these deportations from happening. As U.S. citizens, we must exercise our privilege and right to vote against these unjust practices, and use our voices to uplift the affected communities. It is shocking how little press this important issue is getting, and it is vital that we all raise awareness of the deportations and fight for justice. As youth, since we are not old enough to vote, we must find other ways to get involved – using our platforms in social media, at schools, and within our communities to raise awareness of the issues, helping giving out resources, signing petitions, following current events, and getting involved with local organizations. Together we can fight the injustices committed against our Southeast Asian communities. Thompson, Dom. 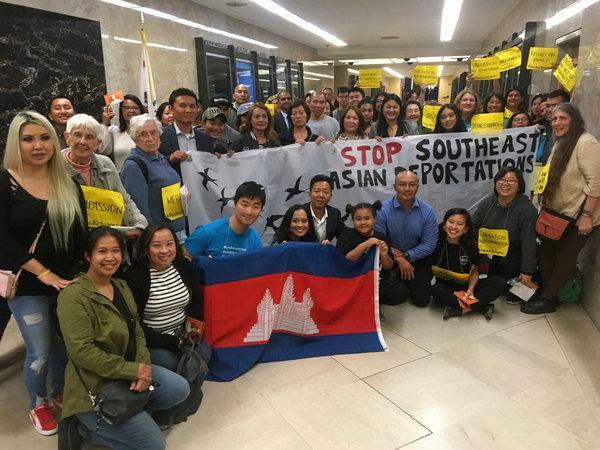 “Advocates at an October rally in Sacramento, Calif., hold banners and signs backing pardons for Southeast Asian refugees who face deportation because they have committed crimes in the United States.” The New York Times, Charles Dunst, 12 Dec, 2018. www.nytimes.com/2018/12/12/world/asia/trump-deport-cambodians.html. This entry was posted in Current Events and tagged AAPI community, API families, apicommunity, Immigrant Rights, immigration. Bookmark the permalink.